The official first album by the worlds premiere children's and family fun party performer Davey Doodle. Featuring 14 original songs that will get your toes tapping and dancing to these great songs performed by Davey Doodle. Soon to become a classic collectors edition, since this is where Davey Doodle started it all, and lead to his worldwide musical success with Davey Doodle and the Red Hots!!! 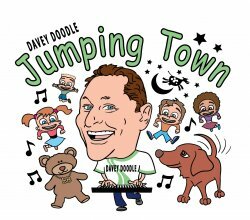 In 2014 he released a collection of 14 original Davey Doodle songs on his new album Jumping Town to bring many types of fun songs to the kids stage. In this album he brings real life characters into life with songs about his dog Truffle Doodle, scoot scooting daughter April, niece Madison in Rhode Island, and nephew Tys stuffed brown bear named BB. He has developed new classics for parties and holidays with the Happy Happy Birthday song and the Very Scary Halloween song. The 2 pieces of Toast song will get you excited about eating the breakfast tasty treat. Other songs take you jumping on musical journeys through busy city streets, dandelion pastures, oceans and Islands, and cruising down all kinds of roads.